The Common Shrew is sometimes mistaken for a mouse; however, its long pointed snout helps to distinguish it from other small rodents. With a head-and-body length of 5 to 8cm and a tail about half its body length, these little mammals have a short life-span of rarely more than a year. Shrews eat insects and occasionally larger invertebrates such as worms, slugs and snaila. In turn, Tawny Owls and Barn Owls keep their numbers in check. Common Shrews are found in hedgerows, meadows and deciduous woodland. They often live in 'second-hand' burrows made by other animals. 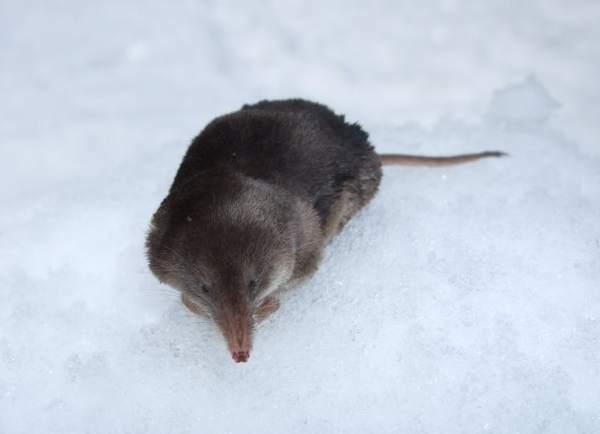 Because Shrews need to feed every two or three hours, they do not hibernate; even in winter you will often hear them foraging for food among dead leaves. These little mammals consume about 80% of their bodyweight daily - mainly insects but also worms, slugs and snails. Shrews can have up to four litters per year between May and September, with typically six youngsters per litter. If you see a line of Shrews, with the youngsters following an adult (invariably the mother, because males play no part in rearing the young) by each holding on to the base of the tail of the one in front, it is likely that their nest has been disturbed and the mother is trying to lead her offspring to safety. Shrews are found throughout mainland Britain and Ireland, including some inshore islands. 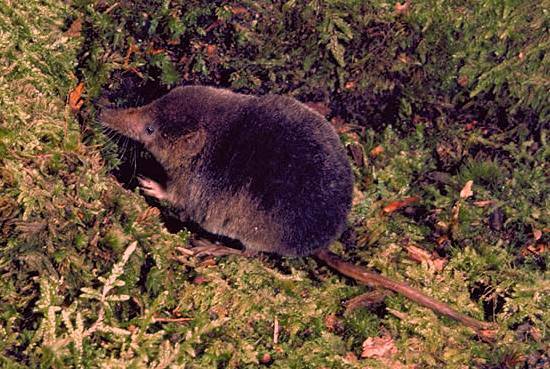 The Common Shrew, found throughout most of Northern Europe, is one of our most abundant mammals. This page includes pictures kindly contributed by the Countryside Council foir Wales and by Tom Pearman.